Do you have permission to send your E-Newsletter? To make sure your e-newsletters aren’t being marked as spam, and to comply with the current CAN-SPAM, every email address on your mailing list needs to have granted you permission to send. You can read more about SPAM compliance here. What is permission to send? Just because you have obtained an email address doesn’t mean you have permission to send email to that address. It depends on how the address was obtained. Sometimes it is clear whether or not you can or can’t email to them. For example, emails that are acquired via a purchased list are never OK to send to since those subscribers have not given their permission for you to contact them. What about social media followers, etc.? Those are people who want to be connected to you but haven’t asked directly to be contacted by email, so they would not be OK to send to without permission. 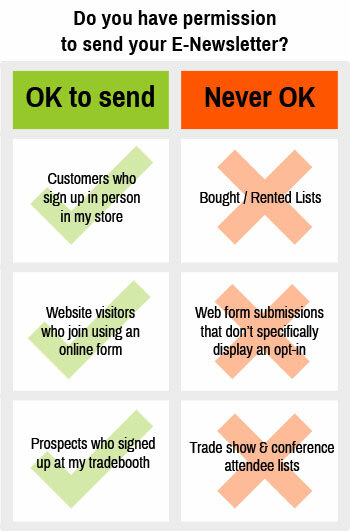 If someone signs up for your mailing list either via your web site or in your store, than it’s definitely OK to send to them. However, there are grayish areas where things can get murky, such as old lists that you haven’t mailed to in a while. Customers who may have forgotten that they signed up for your list are more likely to mark your email as spam, which can damage your sending reputation and can eventually get you blacklisted from certain providers. Let’s say you are selling a product door-to-door; would you be more likely to make a sale by just showing up at someone’s home unannounced, or at a home you have been invited to? Similarly you don’t want to be sending to people who don’t want your emails; doing so costs you money and can add you to spam lists.